Over the last decades, genetic factors for rheumatoid diseases like the HLA haplotypes have been studied extensively. However, during the past years of research, it has become more and more evident that the influence of epigenetic processes on the development of rheumatic diseases is probably as strong as the genetic background of a patient. Epigenetic processes are heritable changes in gene expression without alteration of the nucleotide sequence. Such modifications include chromatin methylation and post-translational modification of histones or other chromatin-associated proteins. The latter comprise the addition of methyl, acetyl, and phosphoryl groups or even larger moieties such as binding of ubiquitin or small ubiquitin-like modifier. The combinatory nature of these processes forms a complex network of epigenetic modifications that regulate gene expression through activation or silencing of genes. This review provides insight into the role of epigenetic alterations in the pathogenesis of rheumatoid arthritis and points out how a better understanding of such mechanisms may lead to novel therapeutic strategies. Rheumatic disorders comprise a large number of different disease entities that are all characterized by musculoskeletal symptoms. Rheumatoid arthritis (RA) not only has a high prevalence but also represents the prototype of an autoimmune inflammatory joint disease that leads to progressive destruction of articular structures, particularly cartilage and bone . Therefore, the impact of epigenetic modifications in the development of rheumatoid diseases will be exemplified by discussing epigenetic changes in RA by focusing on RA synovial fibroblasts (RASFs). Hyperplasia of the synovium with increased cell density and infiltration of inflammatory cells is a hallmark of RA. Although the initiating events are elusive, it has been shown that the interaction of RASFs with invading macrophages, lymphocytes, and the endothelium leads to the development of a specific tissue response. Matrix metalloproteinase (MMP)-producing synovial cells invade into the cartilage and into the subchondral bone. The attachment of synovial cells and particularly of synovial fibroblasts to the cartilage matrix as well as the subsequent upregulation of MMP expression are the results of complex regulatory mechanisms. So far, several genetic factors predisposing for RA have been described, and in particular the influence of distinct HLA haplotypes on disease development and severity has been studied intensively. In addition, polymorphisms of other genes such as PTPN22 have been demonstrated to play a role in the pathogenesis of RA. However, the overall contribution of these genetic susceptibility factors to the development of RA is estimated to be 50% or even less , and numerous studies suggest that other nongenetic but nevertheless gene-regulating factors might individually influence both the susceptibility to RA and disease severity. In this context, a variety of alternative mechanisms of gene regulation have been studied with special focus on epigenetic mechanisms since there is robust evidence that epigenetic modifications are associated with various pathologies such as cancer or chronic inflammation. Given the fact that the whole genome consists of more than 3 billion base pairs, the relatively low number of coding sequences is surprising. Differences, therefore, are likely to be based to a considerable extent on epigenetic changes. Two typical epigenetic modifications with great influence on DNA function are well known, DNA methylation and histone modification. Furthermore, alternative splicing of mRNA expands the mechanisms by which signaling pathways can be influenced. Additionally, recently, a group of endogenous, small, noncoding RNAs, called microRNAs (miRNAs), has been discovered as a new class of regulators of gene function [3–5]. Though not fixed in the DNA code, these changes can be stable over the entire human life span or may be influenced by other factors such as individual differences in lifestyle [6, 7]. Given this complex molecular networking, epigenetic factors may be of key impact on the pathogenesis of RA. This hypothesis is supported by the notion that, in addition to genetic factors, environmental triggers are involved in the development of RA since age, infections, smoking, nutrition, and pollution have been suggested to have an effect on the epigenetic background. Although it is still unknown how these factors contribute to the development of RA in different patients, it is intriguing to speculate that, for instance, the late onset of RA can be explained by the development of a specific epigenetic background during a lifetime as it has been shown in cancer for false patterns of methylation [6, 8]. By comparing monocygotic twins, it has been demonstrated that very similar epigenetic patterns in young twins drift apart over a lifetime, affected by different lifestyles . Most changes were found in patterns of histone deacetylation and methylation. In conclusion, knowledge of the epigenetic processes becomes more and more essential for the understanding of the differences seen in the clinical picture of patients with rheumatic diseases such as RA. The process of gene induction comprises the recruitment of activator or repressor proteins that influence DNA binding, synchronization, and recruitment of RNA polymerase II (RNA-Poly II) to a specific gene. Furthermore, the process requires formation of a whole complex formed by cofactors that are termed enhancosomes. Subsequently, a complex interplay of histone modification and transcriptional activation leads to the induction of specific genes. The term 'epigenetic' (first mentioned by Conrad Waddington in 1942) defines all heritable changes in the expression of genes which are not encoded directly by the DNA sequence of the specific gene itself . This includes DNA methylation, post-transcriptional modifications, chromatin modification, and miRNAs. Epigenetic modifications are a prominent mechanism by which the differentiation of cells is controlled since some genes are repressed by epigenetic silencing during cell development. Epigenetic silencing does not depend on sequence-specific DNA-binding proteins . This feature of epigenetic gene control is important because it may explain how alterations in epigenetic gene regulation may result in tumor genesis or chronic inflammation without clonal expansion of defective cells. Though completely different, the distinct epigenetic factors can interact with each other since there is no clear border between these regulatory pathways. Thus, it is known that a complex interplay between transcription and RNAi (RNA interference) can influence the heterochromatin structure . The DNA is highly organized within the chromatin. This protein-DNA complex compresses the DNA in the nucleus. It can be subdivided into euchromatin and heterochromatin. Euchromatin is decondensed and transcriptionally active whereas heterochromatin is condensed and transcriptionally silenced . Despite the clear distinction of heterochromatin and euchromatin, the chromatin is dynamically modified . The nucleosomes of the protein-DNA complex consist of 4 core histones each surrounded by 146 nucleotides. A highly compact state of chromatin reduces the accessibility of the DNA for transcriptional factors or the RNA-Poly II. Thus, the expression rate of these genes is reduced. The unwinding of the compact chromatin opens the DNA for polymerases or transcription factors and thus initiates transcription. The acetylation of histones is catalyzed by the histone acetyltransferases (HATs), which modify lysine residues at the N-terminus of the histones . Such hyperacetylation is associated with the opening of the chromatin and thus with an enhanced rate of gene transcription. On the other hand, targeted deacetylation of histones is performed by multi-subunit enzyme complexes (for example, the histone deacetylases [HDACs]) . HDACs remove the acetyl group from the histone lysine residues, and the resulting hypoacetylation of the histones reduces the space between the histones and the surrounding DNA. Consequently, the transcription factors are sterically hindered from binding to their motifs on the nucleotide sequence, leading to a silencing of affected genes . The delicate balance between histone acetylation and deactetylation modulates the transcription rates of numerous genes. In addition, both HATs and HDACs have a wide range of protein substrates other than histones. These substrates can modify the activity of proteins involved in transcription, nuclear translocation, and cytoskeletal architecture. Hyperacetylation as well as hypoacetylation of genes have been shown to be associated with disease states. So far, the beneficial therapeutic use of HDAC inhibitors has been shown in cancer  but also in animal models of autoimmune diseases such as multiple sclerosis  and systemic lupus erythematodes . In systemic sclerosis (SSc), the knockdown of HDAC7 in skin fibroblasts  and the treatment of bleomycin-induced skin fibrosis in mice with trichostatin A as a known HDAC inhibitor  remarkably reduced the accumulation of extracellular matrix proteins and therefore fibrosis . In contrast to previous studies demonstrating the successful application of an HDAC inhibitor in vitro  and in an animal model of RA, a recently published report gave evidence of hyperacetylation in RA by comparing nuclear extracts of RA synovial tissue samples with osteoarthritis (OA) tissue samples. The authors found the activity of HDACs to be about twofold lower in extracts of RA patients than in those of OA patients . Therefore, changes in the acetylation pattern in RA have to be addressed in further studies before thinking of molecular therapeutic targets. Besides acetylation, there is increasing evidence that methylation  or demethylation and also citrullination  of histones might extend the epigenetic modifications even though their role in autoimmune disease has not been intensively studied so far. The only known mechanism for a direct modification of DNA sequences after their synthesis is the methylation of nucleotides. This modification changes the function of the methylated DNA dramatically. In eukaryotes, methylation is restricted to the pyrimidin base cytosine, whereas in prokaryotes adenosin can be methylated as well. In prokaryotes, DNA methylation functions as a control mechanism for the restriction system that protects the cells against foreign DNA molecules. In eukaryotes, the silencing of specific genes seems to be the main function of methylated cytosines. In its most common form, DNA methylation takes place at position 5 of the cytosine ring within CpG dinucleotides . Nonmethylated CpG dinucleotides are clustered in regions called CpG islands. Generally, these CpG islands surround the promoter region of constitutive exprimated genes. There are several DNA methyltransferases (Dnmts) that can catalyze these methylation processes, Dnmt 1 as the most abundant methyltransferase. The Dnmt3 family which is capable to methyltes hemi- or unmethylated CpGs. Insertion of a methyl group into DNA by Dnmts results in changes of chromatin formation and in silencing of the affected gene. There are two functional principles of methylation-mediated DNA silencing that can be distinguished. First, direct binding of a transcription factor is hindered, which is caused by sterical changes of the sequence structure. Second, the recognition of a methylated nucleotide can elicit the repressive potential of these regions. Methyl CpG-binding proteins use transcriptional corepressors for transcriptional silencing or may modify the surrounding chromatin of methylated regions . In oncogenesis, hypermethylation of tumor-suppressor genes and hypomethylation of proto-oncogenes are well-known epigenetic phenomena. The aggressive and invasive behavior of RASFs and their increased resistance to apoptosis explain why they are also referred to as cells with a 'tumor-like phenotype' . While there is no genetic background for these alterations, it becomes more and more obvious that epigenetic modifications trigger or at least contribute to the characteristic changes of RASFs. Methylation of CpG islands in the promoter region of the Death receptor 3 (DR3) of RASFs results in a higher resistance for apoptosis . Another study supported the findings of an altered resistance to apoptosis due to epigenetic modifications by showing that treatment with the HDAC inhibitor trichostatin A induces apoptosis in RASFs, while concomitantly FLIP (Flice inhibitory protein) was found to be silenced . Inherited retroviral sequences like LINE-1 (long interspersed nuclear element-1) retrotransposons are known to play a role in cancer. Strikingly, Neidhart and colleagues  showed an increased expression in RA synovium, especially at sites of invasion. Although most of the retrotransposons of the human genome were not functional any more or were silenced by methylation, RASFs showed an increased activity, probably due to a decreased methylation of their promoter . Enforced expression of LINE-1 sequences in RASFs induced the expression of the p38δ mitogen-activated protein kinase, the c-Met receptor, and galectin 3-binding protein, thus contributing to the activated phenotype of RASFs. The increased activity of LINE-1 was associated with genomic hypomethylation in RASFs. In accordance, very recent data strongly support the hypothesis that genomic hypomethylation might play a key role in the pathogenesis of the activated phenotype of RASFs, in particular with respect to their destructive potential. Karouzakis and colleagues  were able to show the presence of hypomethylated nuclei in the synovial tissue of RA patients, and additionally it has been proven that RASFs retained their demethylation profile in vitro. In further experiments, it had been demonstrated that chronic treatment of normal synovial fibroblasts with the Dnmt inhibitor 5-AZA (5-aza-2'-deoxycytidine) changed the cellular profile into an RASF-like phenotype . Besides RA, there is increasing evidence that histone modifications of certain genes might play a role in the pathogenesis of SSc. Recently, Wang and colleagues  proved that hypermethylation of CpG islands and deacetylation in the FLI-1 promoter region in SSc fibroblasts and skin biopsy specimens were associated with increased production of collagen type I. The direct influence of Dnmt3a on the degree of histone modification has been shown . A reduced Dnmt3a expression resulted in an enhaced histone actylation. Tihis underlines the repressory nature of Dnmt3a on acetylation of the core histones. Such findings underline the complex interplay between the different factors of the epigenetic network (Figure 1). 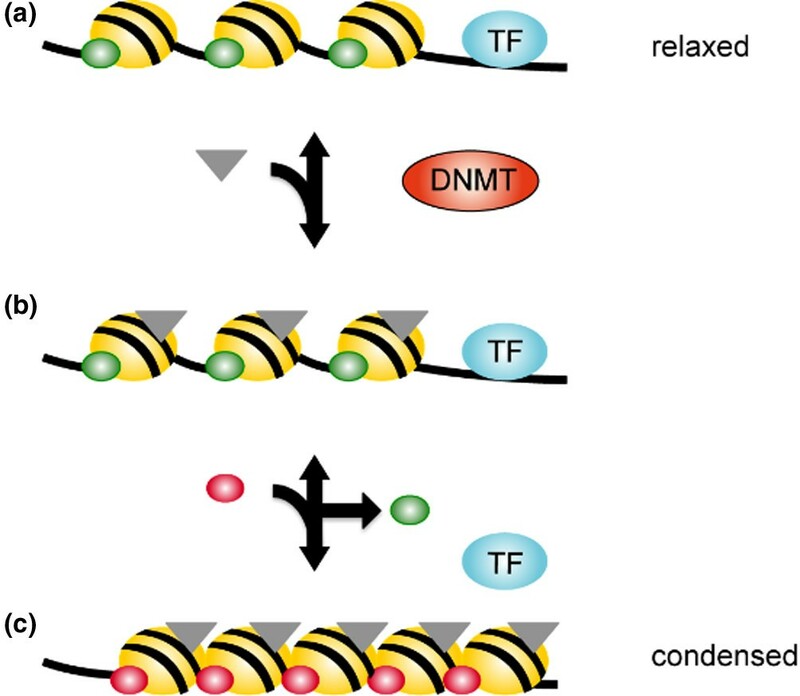 Close interactions between DNA methylation and histone modifications. (a) Relaxed chromatin is accessible for transcription factors (TFs). Chemical modifications (green) on the core histones (yellow) result in a relaxed chromatin structure. (b) DNA methyltransferases (Dnmts) add methyl groups (grey triangle) to CpG dinucleotides, resulting in gene silencing that can affect the former modification of the histones. (c) The chemical modification (red) to the core histone results in a condensed and inactive chromatin structure. TFs are sterically hindered and cannot bind to their recognition sequence on the DNA. In the field of gene expression, a new class of post-transcriptional regulators has recently emerged. These small (19 to 22 nucleotides), endogenous, single-stranded, noncoding RNAs, called miRNAs, account for 2% to 3% of the human genome and are estimated to regulate about 30% of the human genes . Over 50% of known miRNAs are located within introns of coding genes. The biogenesis of these evolutionary highly conserved molecules is carried out in a multistep process. Briefly, the mature single-stranded RNAs are generated from genome-encoded stem-loop precursors. This complex process is mainly catalyzed by two main RNAse III-type endonucleases of which Drosha acts in the nucleus whereas Dicer acts in the cytoplasm. Mature miRNAs that are incorporated into the RNA-induced silencing complex (RISC) recognize the 3'-untranslated region (3'-UTR) of their respective target mRNA by complementary base pairing with the seed sequence (6 to 8 nucleotides) in their 5'-UTR. Based on the fact that a complementarity of 6 nucleotides is sufficient to exert regulatory functions, a single miRNA can potentially interact with several hundred target mRNAs, and each mRNA can be targeted by several miRNAs. This broad diversity of possible interactions amplifies the complexity of the regulation of protein-coding genes. The degree of complementary of the seed sequence with the target mRNA determines the type of mechanism of this post-transcriptional regulation. Perfect complementary is more common in plants than in mammals and results in mRNA degradation . In mammals, the imperfect base pairing occurs more often, and the miRNA-containing RISCs are thought to exert their effects by regulating the stability of the target mRNA or by blocking its translation . Interestingly, there is increasing evidence that miRNAs are not the only negative regulators of gene expression. It has been found that, in response to certain stimuli, sequestered mRNAs may be liberated and even preferentially translated [39, 40]. Given the complexity of the mechanisms regulating gene expression, it seems likely that miRNAs display additional functions aside from mere switch-on or switch-off effects; for example, they might also have 'fine-tuning' properties . Besides this canonical pathway, intronic miRNA precursors that bypass Drosha processing have been discovered, first in Drosophila melanogaster and Caenorhabditis elegans  and later in mammals . These so-called 'mirtrons' enter the pathway of miRNA biogenesis after having been spliced and debranched (Figure 2). MicroRNA (miRNA) biogenesis. 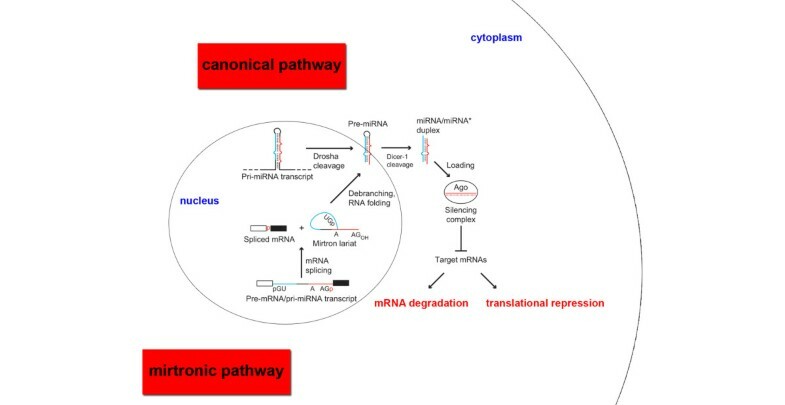 The canonical pathway includes cleavage of pri-miRNAs in the nucleus by Drosha, whereas pre-miRNAs are processed by Dicer in the cytoplasm. Some of the miRNAs located within introns of protein-coding genes bypass Drosha cleavage. These so-called mirtrons are processed from their primary transcripts within an alternative (mirtronic) pathway by splicing and debranching. Finally, from the resulting miRNA duplex, the strand with the higher affinity is assembled into the RNA-induced silencing complex. Complementary base pairing with the target mRNA leads either to degradation of the mRNA or to translational repression, depending on the complement of the sequences. This figure has been modified according to . Ago, Agonaute proteins. miRNAs have been found to be involved in physiological as well as pathological processes, including cellular differentiation, cell cycle progression and apoptosis, embryogenesis , angiogenesis , (cardio-)myogenesis [45–47], metabolism [48–50], neurology , oncogenesis, and viral infections . In addition, there are rapidly accumulating data implicating an important role of miRNAs in the regulation of immune responses and the development of autoimmunity [52–55]. Some recent studies have suggested that altered expression and function of miRNAs might also be involved into the pathogenesis of RA. Stanczyk and colleagues  were able to show that the treatment of RASFs with tumor necrosis factor-alpha (TNF-α) led to an upregulation of miR-155 and miR-146 and that these two miRNAs were constitutively more highly expressed in RASFs than in synovial fibroblasts of patients with OA. Monocytes in the peripheral blood of RA patients also displayed higher levels of miR-155. Besides TNF-α, stimulation of RASFs with interleukin (IL)-1β, lipopolysaccharide, poly(I-C), and bacterial lipoprotein upregulated the expression of miR-155. Furthermore, the enforced expression of miR-155 repressed the levels of MMP-3 and reduced the induction of MMP-3 and MMP-1 by Toll-like receptor ligands and cytokines. Thus, it could be hypothesized that, based on the repressive effect of miR-155 on MMPs, miR-155 might play a role in the modulation of the destructive behavior of RASFs . These findings were supported by another study that reported an enhanced expression of miR-146 in RA synovial tissue and demonstrated that the expression levels of miR-146 in RASFs were increased upon stimulation with TNF-α and IL-1β . The investigation of the impact of altered miRNA expression is currently most advanced in cancer research. There is an increasing number of studies providing new and profound insights in the regulation of gene expression, in particular with respect to the interference of former known epigenetic modifications and miRNAs. Overexpression of certain miRNAs such as miR-10b in breast cancer  and down-regulation of miRNAs such as let-7 in non-small lung cancer cells  or of miR-15 and miR-16 in chronic lymphocytic leukemia  have been found to be implicated in tumor-genesis. Most strikingly, there is increasing evidence that miRNA-encoding genes are both regulators and targets of methylation and acetylation processes. One recently published study was able to show that, in non-small lung cancer cells, the restoration of the downregulated miR-29 family reversed the altered methylation pattern and thus induced re-expression of silenced tumor-suppressor genes  because the members of the miR-29 family were proven to be direct regulators of Dnmt3A and Dnmt3B. Another cartilage-specific miRNA, miR-140, has been proposed to target HDAC4 . Besides, there are accumulating data that miRNAs are also targets of the aforementioned epigenetic modifications. In a large-scale analysis of human miRNA genes, 155 of 332 miRNAs were found to be associated with CpG islands, and the methylation frequency was an order of magnitude higher than that of protein-coding genes (1% to 2%) . A recently published study showed that treatment with chromatin-remodeling drugs, namely the demethylating agent 5-AZA and the HDAC inhibitor phenylbutyrate (PBA), induced the expression of miR-127 in cancer cells but not in normal fibroblasts. Alterations in DNA methylation and histone modification around the promoter region of the mir-127 gene by 5-AZA and PBA treatment restored miR-127 expression in cancer cells with subsequent suppression of the proto-oncogene BCL6 . Given the striking impact of altered miRNA expression on health or disease, they represent promising future therapeutic targets. That this aim is not beyond the realm of possibility is supported by the successful and well-tolerated use of anti-miRs in rodents [48, 64] as well as in non-human primates . Besides systemic administration, a recently published study has demonstrated that local delivery (that is, intradermal application) of anti-miRs might be an alternative strategy . Based on these encouraging results, the first human trial investigating the effects of anti-miR-122 in patients with hepatitis C has now been initiated . So far, no adverse events have been reported. In contrast to the use of anti-miRs, the induction of miRNA mimics in human trials still has additional technical hurdles to face. The discovery of miRNAs will also influence the design of future experimental studies. Osokine and colleagues  draw attention to the fact that, since the majority of the known miRNAs are located within introns, unintentional ablation of miRNA expression might be a major risk factor in gene knockout studies. Their search of published murine knockout studies and databases of gene trap embryonic stem cell lines revealed almost 200 cases in which the knockout of the gene might have disrupted miRNA expression. Based on the demonstrated impact of an altered miRNA expression, it is possible that the reported overt phenotypes might have been more than the mere effect of the gene knockout . There are different post-translational processes with direct or indirect effect on epigenetic events. To illustrate this complex mechanism, we will focus on two important factors, namely ubiquitin and a related family of proteins, the small ubiquitin-like modifiers (SUMOs). The latter proteins have been shown to have a great influence on the ability of RASFs to react on Fas-induced apoptosis. The well-described abilities of SUMO and ubiquitin point out how important the interactions between post-translational processes and epigenetics are. Ubiquitin is an 8-kDa protein consisting of 76 amino acids. Ubiquitination is a well-characterized process that labels target proteins for proteasomal degradation. Additionally, ubiquitination controls the stability, function, and intracellular localization of a wide variety of proteins. The multistep process of ubiquitination is catalyzed by special enzymes and can be completely reversed by deubiquitylating enzymes. With respect to epigenetic modifications, it has been shown that ubiquitination might interact with processes of acetylation and methylation . Additionally, it is well known that at least three steps of the nuclear factor-kappa-B (NF-κB) pathway are regulated by ubiquitination, namely degradation of IkappaB (inhibitor of NF-κB), processing of NF-κB precursors, and activation of the IkappaB kinase . Taken together, these findings suggest that ubiquitination might also play a significant role in the pathogenesis of RA and that its further investigation with respect to this central pathway might be promising. Like ubiquitination, SUMOylation is an enzyme-catalyzed multistep process that specifically targets proteins harboring a SUMO interaction motif . This process is also reversible since the moieties of SUMO can be disconjugated from their targets by specific proteases. With respect to epigenetic regulation of gene expression, some published studies suggest that SUMO promotes HDAC-mediated transcriptional repression [72, 73]. SUMO-mediated transcriptional repression might also involve certain transcription factors or key molecules of signaling cascades. Besides, SUMO modifies the activity and/or localization of proteins with important roles in cell proliferation, differentiation, and apoptosis . However, the underlying molecular effects are not well known yet. In RA, there is evidence that SUMO is overexpressed in synovial tissue and synovial fibroblasts . Very recent data showed that de-SUMOylation in RASFs decreased the levels of histone acetylation with a subsequent reduction of the expression of certain MMPs and ILs, thus diminishing the destructive potential of RASFs . Despite the fact that chemical modulators of ubiquitination and SUMOylation are already available, we first need a better understanding of the underlying molecular mechanisms as well as of the epigenetic impact of these modifications. The transcription factor NF-κB plays a central role in the induction of genes involved in immunity and inflammation, including cytokines, chemokines, adhesion molecules, receptors, and inducible enzymes such as COX-2 and inducible nitric oxide synthase . Thus, the idea that the inhibition of NF-κB could abrogate the signaling of pro-inflammatory cytokines makes it an attractive therapeutic target in RA. Interestingly, there is evidence that the binding of NF-κB to its nucleosomal targets requires conformational changes of histones to render its binding sites accessible . It has been shown that pro-inflammatory signaling initiated modifications of histones such as acetylation of histone 3, phosphoacetylation of histone 4, and reduced methylation of H3K9 that was accompanied by activation of RNA-Poly II. As a consequence of these modifications, an increased recruitment of NF-κB to the promoter of several cytokines and chemokines could be observed . To add to this complexity, IL-6, a major cytokine in the pathogenesis of RA, is known not only to be an NF-κB-inducible gene but also to initiate epigenetic modifications itself. In cancer, it has been found that IL-6 enhanced and maintained the hyper-methylation of the promoters of the tumor-suppressor gene p53 and of hHR23B, a key factor of DNA repair in a multiple myeloma cell line . Furthermore, it has been demonstrated to induce hypomethylation of the EGFR (epidermal growth factor receptor) promoter, thus enhancing the proliferation of cholangiocellular carcinoma cells . Interestingly, there are accumulating data that enforced expression of IL-6 in tumors alters not only the expression levels of certain miRNAs [82, 83] but also their methylation-dependent regulation . In summary, these findings support the hypothesis that a highly complex epigenetic control mediates immune and inflammatory responses. Area with a clear focus on the epigenome, whereas the Epigentic Society (formerly the DNA Methylation Society) supports and enhances the networks between scientists with a focus on epigenetic processes. Current and future research will provide new insights into the complex pathogenesis of rheumatic diseases and thus enable the development of a molecular-based targeted therapy. That this is not beyond the realm of possibility is supported by the fact that miRNA-modulating agents have already entered clinical trials. However, the application of epigenetic drugs other than miRNA-targeting drugs in non-malignant diseases still has to overcome major hurdles because of potential severe off-target effects. This article is part of a special collection of reviews, The Scientific Basis of Rheumatology: A Decade of Progress, published to mark Arthritis Research & Therapy's 10th anniversary. Simon Strietholt, Britta Maurer contributed equally to this work.